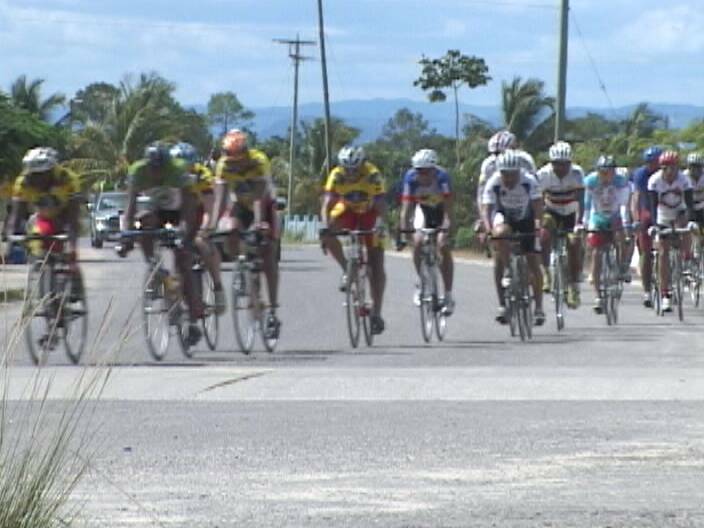 The 6th Annual Sagitun Cycling Classic was staged yesterday at Independence with a whopping 60 riders suited up for the 66 Mile Open race on a circuit from Senter to PG Junction, through Big Creek and back to Senter for the big finish. And of course their off. 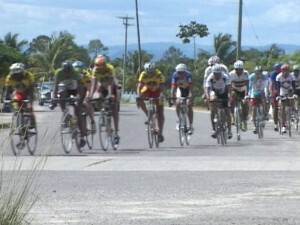 This group of seven riders which includes the Guatemalan Donizette Vasquez-Aburto of Despredadores, Chris McNish of Benny’s Megabytes, Lisando Acu and Kyne Gentle of Western Spirit extricates itself from the main bunch around the halfway mile. We head to the finish now and it’s the Guatemalan Donizette Vasquez-Aburto of Despredadores who takes to 5 man sprint grabbing top honors in 2 hours 40 minutes 35 seconds. Chris McNish of Benny’s Megabytes is 2nd, Lisandro Acu of Santino’s is 3r, Kyne Gentle pulls up 4th while Luis Santizo, another Guatemalan rounds out the top 5 in a race that averaged 24.66 miles per hour with 24 riders abandoning the event. In the Master’s Class, 3 time cross country champion, Ernest Meighan of Santino’s easily fool that 33 mile race in 1 hour 26 minutes 4 secs beating out Wilbert Jones of Benny’s megabytes and Ken Gladden of Typhoon in that order. Henry Moreira and Luigi Urbina rounds out the top 5 in a race that averaged 23 miles per hour with 24 of the 30 cyclist that started completing the ride. Two females also participated in this class—Shalini Zabaneh beat out Jr. Rider, Patricia Chavarria by 14 minutes 14 seconds. 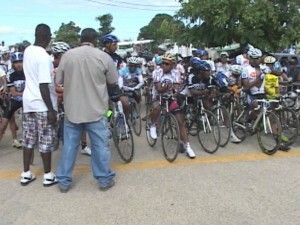 Meanwhile the Jr. 77 mile rode saw Daniel Choto of Cayo High Road Cycling outsprint Deezan Spencer of Clear the Land to claim top honors in a time of 2 hours 25 minutes 57 seconds with an average speed of 22.61 miles per hour. Joel Borland of Indeco then beat the Guatemalan Alejandro Tejero for 3rd place while Darren Williams rounds out the top 5 in a race that saw 30 start and 15 finish. The next big cycling event on the calendar comes up this Sunday, November 14th, right here in Belize City as the University of the West Indies proudly presents a day of races on Marine Boulevard and it promises to be big. Turning to the Body Building Scene, the Mister Belize Contest grabbed center stage inside the Bliss Auditorium Friday night with a monster package of wall to wall muscle. We go immediately to the four man clash for competition under the 170 pounds and by the way we always thought that body building was a non-contact sport. In his debut, Giovanni Gomez takes on the big boys but can only muster up a fourth place finish. We’re certain you will hear from this athlete again. Allen Holliday has the size and the ambition but his symmetry and definition is not pronounced enough to truly challenge for the tile and he has to settle for 3rd place. In the meantime, Deon Ortiz shows real promise as a bodybuilder and will win the Mister Belize title sooner rather than later, but he is just not ready to depose the king, Deon Danderson. Ortiz has to settle for the runner-up spot, 2010. For his part, the reigning Mister Belize title holder, comes out on top of his game and ready for prime time to win the under 170 pounds class almost hands down. In fact, this podium shot emphasizes the distance between Danderson and the rest as he gets ready to challenge for the Mister Belize title again. At the over 170 pounds meanwhile, tonight’s contenders are Edwin Ramirez, Deon banner, Victor Valencia and Rico Vellos. Victor Valencia does need to put in a lot of work to become an elite bodybuilder and does not make it to the podium tonight. Deon Banner also needs fine tuning to display the definition demanded at this level. He shows promise but is relegated to third place. Rico Vellos threw down a strong challenge with this exhibition. He has size, shape and presence but it’s only good enough for second place tonight. Why? Well former Mister Belize, Edwin Ramirez, is in his element and pulls out quite a show in his routine that earns him the win at this weight class. And as we go to the podium shot, all we can say is that a picture tells a thousand words. So now the two divisional winners meet in a face off at the 2010 Mister Belize title of bodybuilding and you’ve got to be an expert to determine who is the winner here. 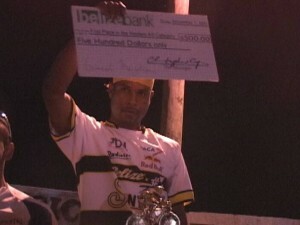 The judges are and they decide that Deon Danderson is the better of the two today and we say congratulations. We now turn to the Miss Belize Body fitness competition and standing in the winner’s circle again, Kayla Myvette. Newcomers, Olga Vidas and Kaina Martinez finish second and third respectively while former champion, Gina Lovell, was relegated to fourth place. This brought a howl of protest from the fans, but the decision stands. Turning to the football scene, action in the FFB’s Inter-district Competition over the weekend saw Club Athletico eliminated Cristo Rey in a 3-2 aggregate after yesterdat’s 1-1 draw at Corozal. Down South, Benguche forced extra time after beating Libertadores 2-1 but Libertadores came up with 2 goals in extra time to move on. P.G. 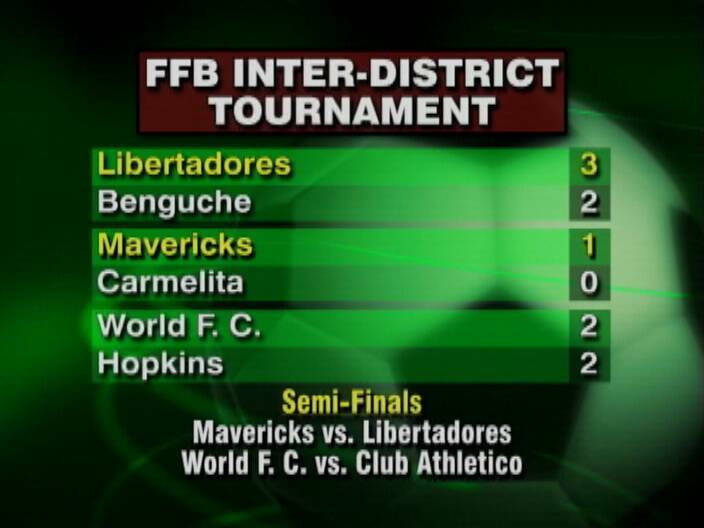 Mavericks got into the semifinals with a 1-zip defeat off Carmelita while World FC held Hopkins to a 2 all draw which was enough to get them into the next week. 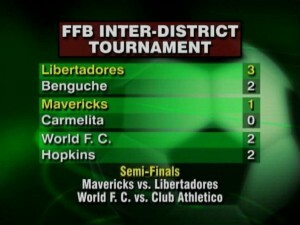 Thus the semifinal round gets off this Sunday with Mavericks travelling to Libertadores while World FC will play host to Club Athleticos. In BPFL results: Toledo Ambassadors edged hankook Verdes 1-zip, FC Belize sink the San Pedro Sea Dogs in a 4-1 blast, san Felipe Barcelona blanked Belmopan Blaze 1-zip while B.D.F. and Griga United settled to a scoreless stalemate. Finally in Tennis Table news, on Saturday Bombers crushed No Mercy 5-1 in 1st division play and Racqueteers rallied past Rivero Welders in a 5-4 decision. At the 2nd division level, Phoenix shook up Hurricane 5-3 and Garage mashed up Assassins in a 5-zip finish. 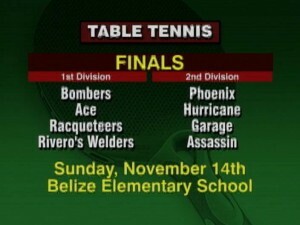 Thus the 4 teams to make the 1st diviosn finals are Bombers, Ace, Racqueteers and Rivero Welders. And in the 2nd Division play its Phoenix, Hurricane, Garage and Assassins. The finals is set for Sunday, November 14th, at Belize Elementary auditorium featuring a round robin format in both categories and you don’t want to miss it. Just to update the public; Gina Lovell actually got 2nd place, the judges seemed to have got the ladies numbers wrong.